Whether you manufacture furniture, are an interior designer, or own a furniture store having a website should be a top priority. Websites not only reach more people, but are also a great way of introducing a new audience to your designs and products. It is way easier to build a following of loyal customers online than it is offline. 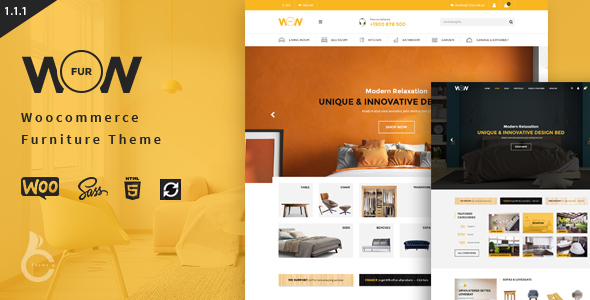 With this in mind, we have created a comprehensive catalogue featuring the best furniture WordPress themes. These themes will help you develop a professional and eye-catching website with only a few dollars. 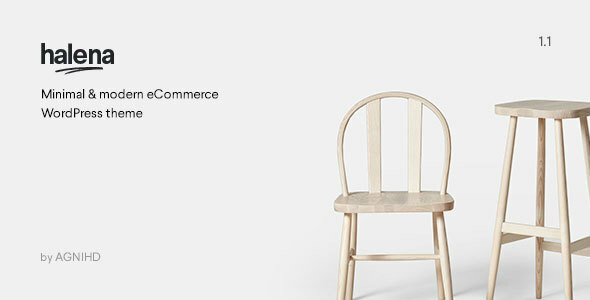 All the furniture WordPress themes presented below are premium and can be found on ThemeForest. Check them out! Halena is one of the best choices when it comes to furniture WordPress themes. Its design is simple, clean, modern, and chic. It offers the possibility of creating unique layouts that bring out the best in your products. 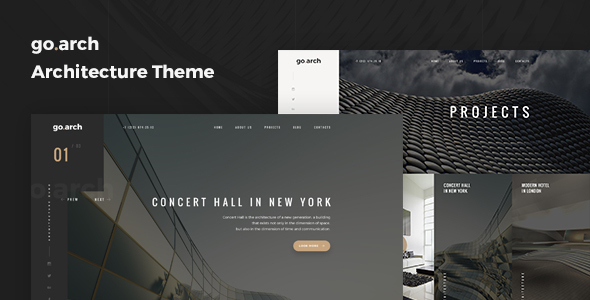 This attractive theme comes with an integrated page builder, pre-designed page layouts, an intuitive product filter, search form, single product templates, a stunning lookbook, Typekit fonts, and custom fonts. No matter the settings you choose to use with Halena it will turn out amazing. All your work is in vain if nobody gets to enjoy it, this is why developing an online presence will turn the tide for any business. Robin will give your business an extra edge and style with its impeccable design and professionalism. This theme will prove indispensable thanks to its stunning homepages, sliders, shop archives, product categories, and product details pages. Apart from these, Robin also includes a user friendly admin panel from where you can customize your theme without writing code. This is the perfect theme! When you are an interior designer or furniture manufacturer you have to make people see and appreciate your work. What better way to do it then with Oritina? Oritina will showcase your products in a cool and stylish way that will be impossible for people to forget or turn away from. Every design challenge is met and completed by Oritina due to its powerful admin panel and limitless tools. This gorgeous theme has more than 20 homepage designs ready for you, an Ajax filter, Visual Composer, 8 choices in footer, and 6 headers. Oritina is a must to check out. I can honestly say without a second though that Wow is one of the best furniture WordPress themes on the market. Every single design element looks unique, ultra-modern, and immaculate. It does not matter how big or small your company is, Wow will take it up a notch. With it you can use various homepages, unlimited colors, WooCommerce, advanced filters, mega menu, and shortcodes. Using the portfolio option you will be able to display your most beloved products and impress new clients. The installation is very easy and takes minutes. Try Wow out! 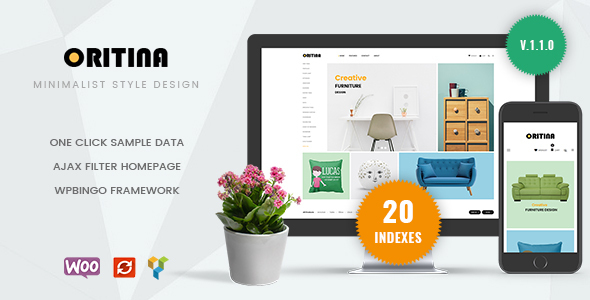 Carna is one of those furniture WordPress themes that have it all: a beautiful design, useful tools, full documentation, and a completely responsive design. The developers behind Carna did their best to enter in this competitive niche with a great theme and they succeeded. This theme has 4 unique homepages, a layout that will adapt to all devices, animated and stunning slider, social media buttons, powerful menu plugin, and unlimited color schemes. Even if it has all these features and many more it is still simple to navigate and work with. If you use Carna you will never look at other themes the same. 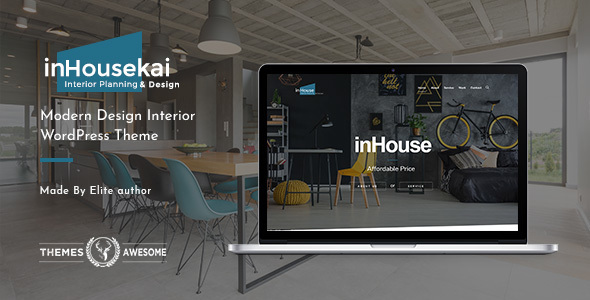 Inhousekai is a well-developed, eye-catching, clean coded, SEO friendly, and fully responsive interior design and furniture WordPress theme. By using this theme you get no restrictions when it comes to the design and you can easily control the layout on your front page, portfolio, inner pages, header, and footer. Furthermore, with Inhousekai you can choose the color skin, slider style, and typography. A full documentation and support team are ready to answer your questions and provide help when you get stuck. You will instantly fall head over heels with Inhousekai! 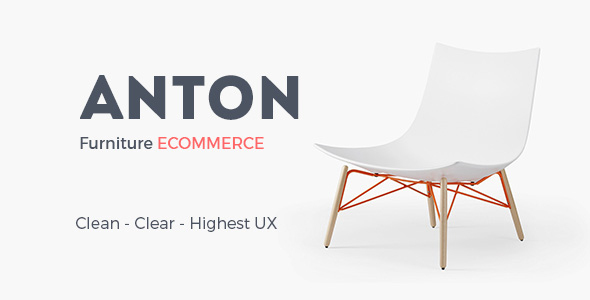 SNS Anton is a brilliant WordPress theme crafted exclusively to be used as a platform for furniture stores and interior designers. It catches your eye from the moment you open it without being overbearing or low in quality. SNS Anton incorporates a bunch of features among which are 6+ gorgeous homepage layouts, product tabs layouts, product page templates, Ajax filter, free Revolution slider and Visual Composer, and social media. Play around with SNS Anton and try it out to see how good it fits. 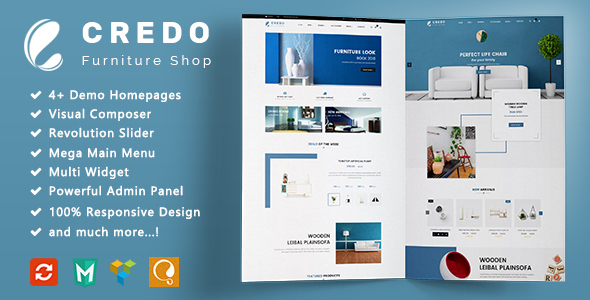 Credo is a bold, beautiful, inventive, and nice looking premium WordPress theme. Credo allows you to play with its elements and build quirky layouts. 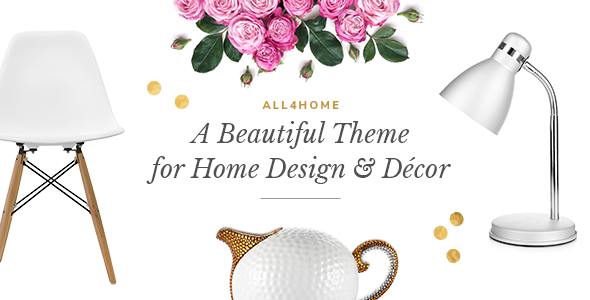 You can get started with one of their beautiful homepage layouts, and then personalize them. You can add social media links, change the color scheme, edit the slider, use mega menu, create a post carousel, and more. Using WooCommerce you can create a shop page to sell your products. Check out and try Credo! 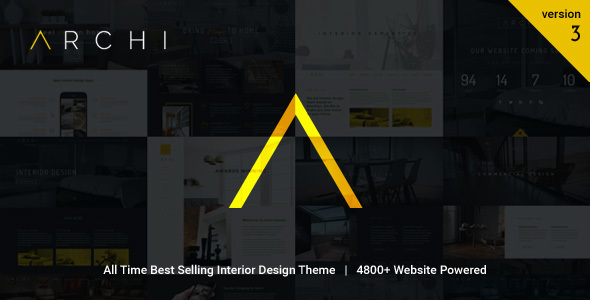 All4home is a radiant, fast loading, vibrant, resourceful, visually stunning, popular furniture WordPress theme. This theme is exceptionally well-coded and designed and you can adapt it to any type of business. It is very easy to install it and to save time you can choose one of its 9 already designed front page templates. To make it even easier for you with a one click you can have an exact copy of the demo instead of starting fresh. It comes with a bunch of custom shortcodes and widgets ideal for furniture related websites. All4home is gorgeous and useful! If you are an interior designer or furniture manufacturer, Geometry is the right choice for you. It will help you present your products and skills in an appealing and engaging manner that will make stop your audience in its tracks. 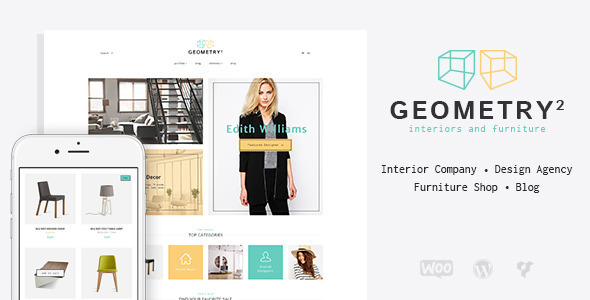 You have tons of options with Geometry starting with various home page demos, banners, offers and promos, Revolution Slider, portfolio, team section, online shop, testimonials, Swipe slider, and Visual Composer. Make your way up from the bottom to the top with Geometry! 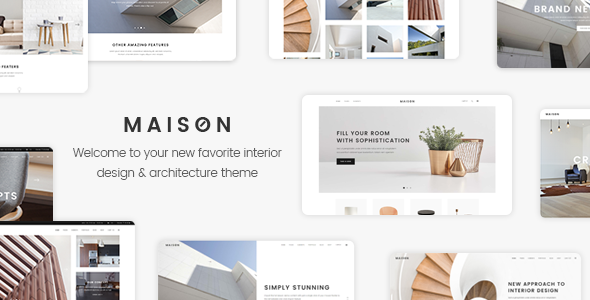 Out of the furniture WordPress themes presented here Maison might just be the most reliable and versatile. It comes with a classic, modern, and professional look that will make any type of interior design website look incredible. You can organize your homepage however you want and to give you some inspiration you have 12 pre-made layouts to look at. The blog, portfolio, and shop pages also have pre-designed layouts you can select. This theme was designed to be intuitive and a great solution for beginners and advanced users alike. 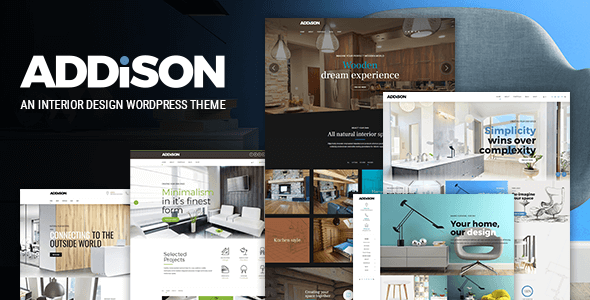 Addison is yet another perfect interior design WordPress with a minimalist, clean, and pristine design. Addison was fully tested across all browsers and devices for compatibility and responsiveness. Furthermore, it comes with several portfolio styles, a bold page builder, dozens of fonts and colors, header and menu layouts, custom icons pack, cost calculator, and demo content. This is without question a premium quality theme that deserves your interest. Take a look at its live preview and see for yourself how amazing it is. 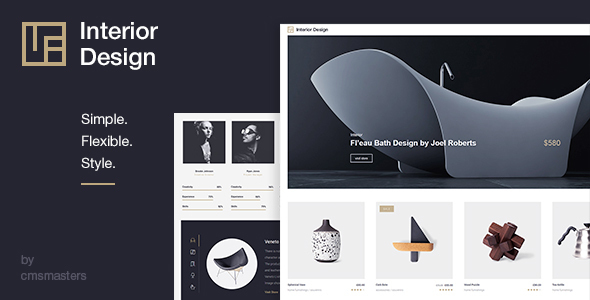 Interior Design is a powerful, amazing, highly customizable, fresh, responsive furniture WordPress theme. You can easily adapt it for interior designs, architecture, and renovation websites. The most important feature of an interior design website is the portfolio and with this theme you can style it and change its layout to make it stand out. Additionally, you can start selling your services and designs with the help of WooCommerce. Grow your business with Interior Design! Gravity will offer your audience a one of a kind experience and make a long lasting first impression. 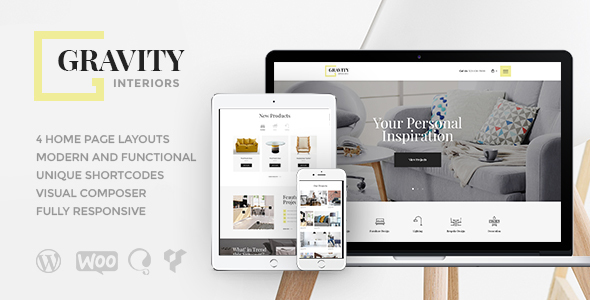 Gravity is a cozy, familiar, and clean furniture WordPress theme that will spark conversations and spread the word. Some of its key features are compatibility with major plugins, integration with WooCommerce, Slider Revolution, Swiper slider, Visual Composer, flexibility with colors and fonts, various layouts and designs, blog settings, several icons and effects, and a detailed documentation. Make your website more approachable with Gravity! Go.arch is a complete and reliable furniture WordPress theme with a gorgeous, adaptable, and minimal design. It would be an understatement to say that this theme has many features. It comes packed with useful and intuitive tools such as black/white versions, WP Bakery page builder, premium slider, header styles, 7 pre-defined color schemes, free support, a complete documentation, PSD files, contact form, and custom widgets. Moreover, Go.arch is engaging and SEO and speed optimized. A delightful choice! 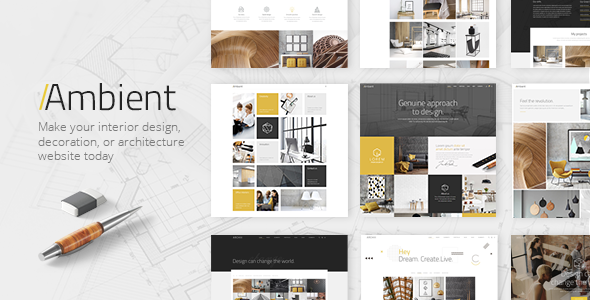 Archi is hats off one of the best furniture WordPress themes available on ThemeForest. This incredible premium theme is bursting with options and features all integrated in a powerful admin panel. Archi comes bundled with Visual Composer and Slider Revolution both for free. You can create stylish and professional product pages with WooCommerce and custom widgets. Additionally, you get unlimited colors and white and dark schemes. You will fall in love with Archi from the first moment. 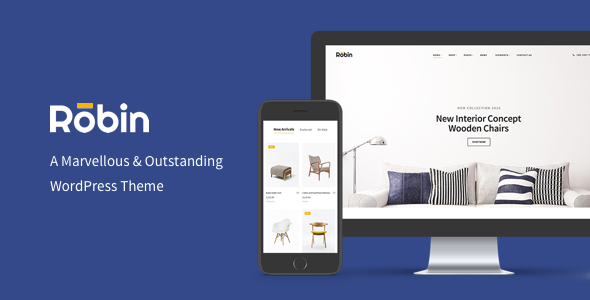 Sofani is a best-selling featured WordPress themes for furniture stores and interior designers. Its design is stellar and will satisfy all of your needs in terms of look and functionality. 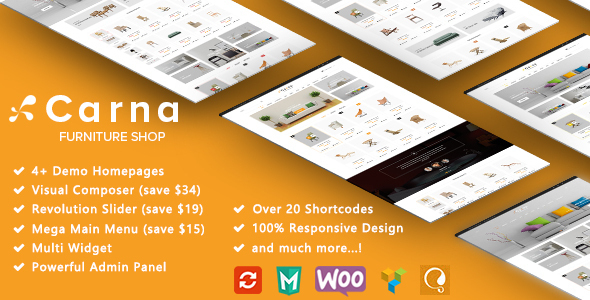 Sofani has a responsive layout, WooCommerce compatibility, over a dozen front page demos, different styles for the portfolio, Font Awesome icons, and pre-designed footer and header styles. The effects and colors are very easy to customize to create new unique styles. Sofani comes with a great tech support team that will go above and beyond to help. 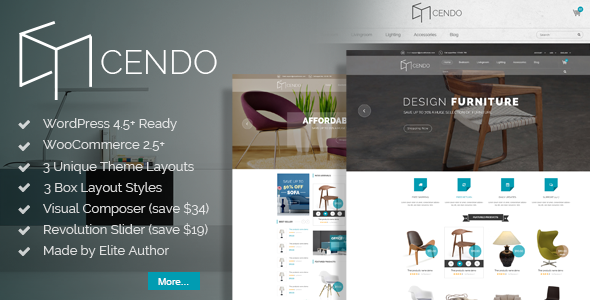 VG Cendo is a modernly design, versatile, good-looking, and unique WordPress theme crafted by designers for designers. All the elements are highly customizable and not a single one requires custom coding or additional CSS changes to make it the way you need. You get several theme layouts, preset colors, instant search, mega menu, lots of shortcodes, WP Bakery, and a few others. Once you are done creating the perfect layout for your business you can start populating it with your products and content. Anything you add to it will look impeccable. Not too bad! 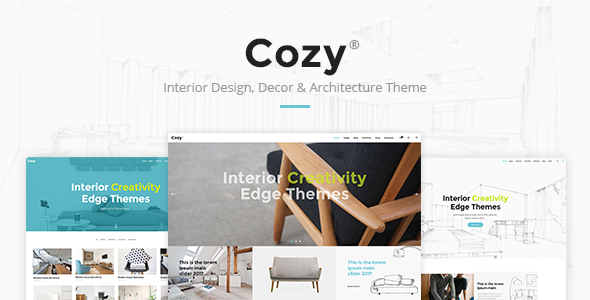 Cozy is a versatile and intuitive theme that will prove to be a reliable platform for developing furniture stores websites. With Cozy anyone can create solid and powerful websites to promote their business in the online world as well. Cozy is full of tools such as several header and menu styles, integration with WooCommerce, knowledgeable support, free premium plugins, translation support, and an user friendly theme panel. Cozy makes it a piece of cake to develop a pristine website. And with this we have reached our last but not least template on our furniture WordPress themes list. Ambient is a complete, outgoing, attention-grabber, pliable platform for businesses everywhere. It comes with chic portfolio layouts, full demo content importer, inner pages, 800+ typography options, extensive documentation, and responsive design. With all these amazing features, we just couldn’t finish our list without including Ambient. All in all, Ambient is a cool choice for anyone. Have you found the theme you were looking for? 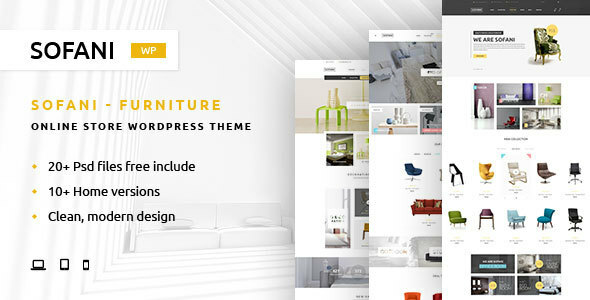 Do you believe there is a theme suitable for our top furniture WordPress themes that we missed? Let us know! And keep in mind, a website is a certain boost for any business, but especially for furniture stores and interior designers.